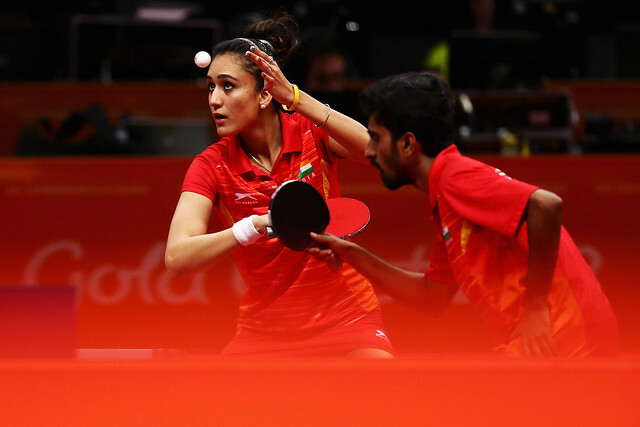 Crucial positions in the team, the second player called to action, either to double the advantage or to draw level; at the quarter-final stage of the Women’s Team event at the Gold Coast 2018 Commonwealth Games on the morning of Saturday 7th April, those key roles were entrusted to Madhurika Patkar and Tin-Tin Ho. Both responded, the end result was that both India and England reserved semi-final places. The success recorded by Tin-Tin Ho was pivotal to England’s three-one win against Canada; she beat Alicia Cote in five games (11-8, 7-11, 11-6, 9-11, 11-5), after Kelly Sibley had experienced defeat at the hands of the ice cool Zhang Mo (5-11, 11-8, 11-4, 11-9). Matters level, in a full distance five games duel, Kelly Sibley and Maria Tspatsinos combined to beat Alicia Cote and Justina Yeung (11-6, 11-4, 7-11, 5-11, 11-4). It was a crucial success but the pressure was firmly on the shoulders of Tin-Tin Ho as she faced Justina Yeung; the fifth match of the contest was scheduled for Maria Tsaptsinos versus Zhang Mo. No disrespect to Maria Tspatsinos, who when sitting on the bench leaps to her feet to applaud every English success, the true team player, but she was not the favourite to beat Zhang Mo. For England, realistically Tin-Tin Ho had to win; she did, she succeeded in four games (11-4, 8-11, 11-3, 11-8), notably in the third game winning the first seven points). The wins recorded by Tin-Tin Ho proved the backbone of English success; the success of Madhurika Patkar set India on the road to a three-nil win against Malaysia. She beat Karen Lyne, a left hander with supple wrists (7-11, 11-9, 11-9, 11-3), after Manika Batra had given India the lead by accounting for Ho Ying (11-9, 11-7, 11-7). India two matches to nil ahead, Madhurika Patkar returned to the fray, she partnered Mouma Das to success against Tee Ai Xin and Ho Ying (11-8, 10-12, 11-8, 11-7). India now meets England in the semi-finals; the penultimate round contests will be played on Sunday 8th April commencing with Singapore versus Australia at 9.00am.